KFC is setting a new standard for fast-food innovation by rolling out a Southern staple typically found at bougie breakfast houses or Sunday brunch: chicken and waffles. After years of testing, the Louisville, Ky.-based division of Yum! Brands is introducing Kentucky Fried Chicken & Waffles to its menu on Monday, Nov. 12, for a limited time. The meal, which will also be offered as sandwich, is served with individual tubs of Mrs. Butterworth syrup. Zahumensky, tapped as CMO last December, said KFC is tackling unchartered territory by making the dish available anytime of the day at nearly 4,200 restaurants across the U.S., and through delivery. Even more incredible, the meal, priced just below $6, comes at fast-food speed and without the sticker shock of sit-down restaurant tab, she added. 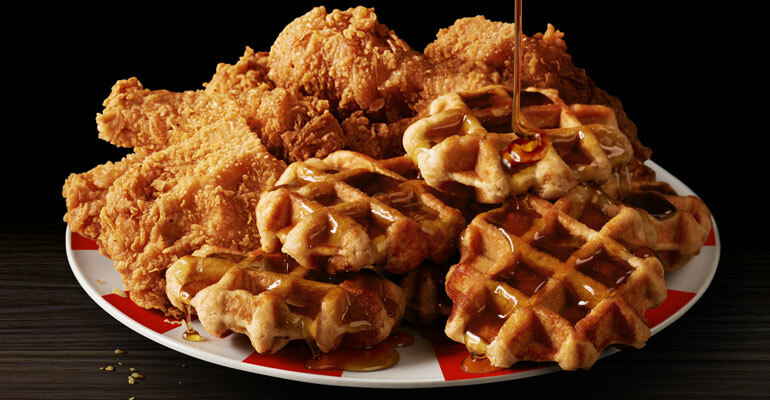 KFC, which has introduced a slew of unconventional limited-time offers this year, said it went through at least 15 different variations of waffles before going with a sweet liege version. The yeast raised dough waffles are infused with pearl sugars imported from Belgium and baked in cast iron plates by HartyBake, a family-owned company based in Atlanta. At the restaurant, each waffle is thawed, and fried to order to create a crunchy outer texture. The $5.49 meal includes one waffle (equivalent in size to a Crispy Colonel sandwich fillet), syrup and choice of one breast fillet, two-piece thigh and drum, or three-piece tenders. It can also be ordered as a sandwich for $5.99 using the Hot Honey flavored breast fillet. Introducing the Southern dish is part of the brand’s re-colonelization effort, which promises playful iterations of Colonel Sanders and the introduction of cult-like menu items. Industry analysts said KFC is smartly taking advantage of a popular food trend that should resonate with young consumers and lapsed diners. “It’s a good idea for KFC to introduce it if they believe they can pull it off,” Mark Kalinowski of Kalinowski Equity Research told NRN on Friday. 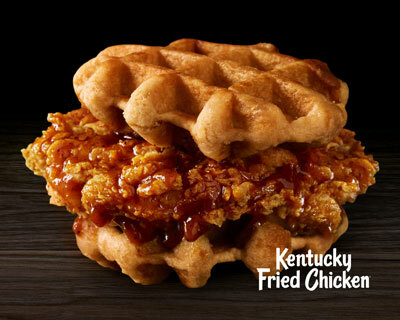 While KFC’s culinary team is breaking new ground for the brand, this is not the first-time a fast food chain has tinkered with waffles. Taco Bell, another division of Yum Brands, briefly offered a waffle taco on its fledgling breakfast menu in 2014. That same year, Chick-fil-A also tested chicken and waffles. KFC’s chicken and waffles will be available through the end of 2018. Restaurants are also including waffles in Big Basket meals starting at $7.99. That meal includes two waffles, two syrups and choice of two-piece white meat, three-piece dark meat, or four-piece tenders.